Eddie Cusack (Chuck) is a Chicago cop under attack on all fronts. The Italian mob hates him because he and his partner Det. Dorato (Farina) got involved in a drug deal they were doing with the Colombian cartel, led by the evil Comacho (Silva). Now the Colombians are after his blood as well. And even members of his own department are after him because his honesty and integrity forces him to break the “code of silence” when a fellow cop Cragie (Foody) shoots an unarmed teenager and plants a gun on him. And his young, new partner that he didn’t initially want, Kopalas (Guzaldo) is cracking under the strain. But Cusack does have a dependable ally in all this mess: a prototype police robot named Prowler. Will Cusack and Prowler win the day? Find out today! 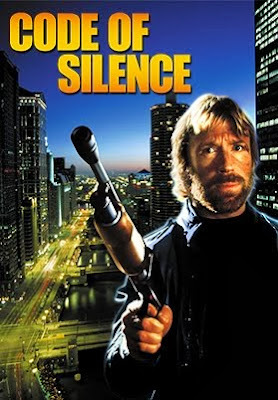 Code Of Silence is a classic 80’s adult cop drama. It’s also one of Chuck’s best. The makers of this movie were smart: they crafted a vehicle for Chuck that plays to all of his strengths. (Though this seems to be somewhat accidental, as Chuck wasn’t the first choice for the role of Cusack). Here, Chuck is the strong, silent type: a rock of relative calm in the sea of chaos around him. He’s not “wooden”, he’s quiet, reserved, even contemplative. Someone finally decided that Chuck could be in a serious-minded, non-goofy movie, and not only does it completely work, but it’s a highlight in his career. Stallone perhaps could have played the Eddie Cusack role, and truly this is Chuck’s Nighthawks (1981). They both grew beards and wore sweaters to prove they could make gritty, realistic fare for grown-ups. Smartly, the makers of Code Of Silence saved all the action for the final third, which makes total sense. Now, in today’s ADD-afflicted culture, someone somewhere decided movies have to have Vin Diesel or The Rock doing some sort of cartoonish, silly CGI car stunt in front of a green screen in the first seconds of a movie (or trailer) in order to satisfy an audience of dummies. By contrast, Code Of Silence’s pace is slow and deliberate, and thank goodness for that. It hearkens back to a time when action movies were MOVIES, not glorified video games. With the passing of time, Code Of Silence looks better than ever. Some of our most-loved cliches are on board as well, such as the WYC (White Yelling Chief), the copious sax on the soundtrack, and, in a 2-for-1, the abandoned warehouse in an abandoned shipyard. 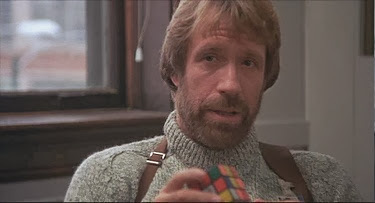 And, proving definitively it was the glorious 80’s, Chuck has a Rubik’s cube. The great Henry Silva makes a worthy enemy for The Chuckster, and Dennis Farina is a great buddy for him to have. And Ralph Foody is the original foodie. Director Davis went on to work with Seagal on his vehicles Above The Law (1988) and Under Siege (1992), but don’t hold that against him. Code Of Silence is a winner all around. Sadly, they don’t make ‘em like this anymore, but at least we have gems like Code Of Silence to remember that quality used to come to the movie theater. Was Stallone really the first choice for Cusack? That would make sense considering the appearance of the robot. Stallone had a thing for robots in 1985. This is a pretty good Norris flick. Like you say, all the action is reserved for the final act so it's below Invasion USA and Delta Force for me but above Eye for an Eye and The Octagon. Totally agree, solid Norris flick. Agree with where it stands too. One of Norris' all time greats, with a satisfying level of violence and unwarranted brutality. The Chicago location was hard to beat in the 80's, with its working class grit and atmosphere. Along with Lone Wolf McQuade, Invasion USA and Forced Vengeance, this is the cream of the crop for Chuck in the 80's. Classic 80s Chuck! Totally agree, this was a lot of fun. Personally I love both Vin Diesel and The Rock, Fast and Furious is honestly one of my favorite franchises. Still I do miss the classic Norris films like this one. Vin and The Rock should do more Hard R action, no more fast and furious movies. Maybe one day, that might happen...Haha. This was actually written for Clint Eastwood, supposedly as part of the Dirty Harry franchise, but Clint turned it down. Another turned-down Dirty Harry vehicle was The Big Score with Fred Williamson. Personally, I prefer the more OTT Norris movies like Missing In Action and Invasion USA, but it's always enjoyable to watch Chuck. Thanks for the info! Appreciate it. This was pretty good. Hard to beat Invasion USA though. Great review! This was always my fave Chuck film and I think it rivals The Fugitive as Davis' best work. And has there EVER been a better line than "If I want your opinion, I'll beat it out of you"? Thanks! Killer line by Chuck. Love it. One of my favorites movies with Chuck. Great review.